Which will it be: solid hardwood flooring or engineered wood flooring? Wood flooring manufacturers once styled engineered wood flooring as a reasonable, but not entirely adequate or worthy, substitute for 100-percent solid wood flooring. Solid hardwood was viewed by consumers and even some makers as still being the one and only true wood flooring, with engineered a pale second. 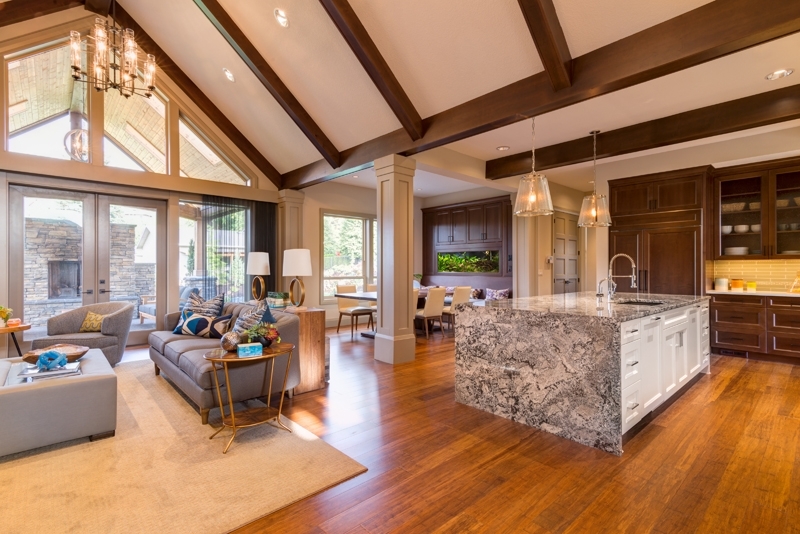 Times have changed, and engineered wood comprises a majority share of the wood floor market. Neither floor type can be called best in a global sense. But each has strong points and a few deficits in individual categories. Basics Engineered wood is a layered product made of an actual but thin slice of hardwood on top of a base of high-quality plywood. Solid hardwood and nothing but hardwood, a homogeneous product from top to bottom and side to side. Thickness, Width Thickness can range from 3/8-inch to 1/2-inch. Standard widths are 3 1/4-inch, with plank sizes starting at 5 inches wide. Thickness typically is 3/4-inch. The standard width begins at 2 1/4 inches wide. Plank width begins at 5 inches and can go up to 11 inches wide. Pre-finished vs. Site-finished Most engineered wood floors are pre-finished, though some companies do make site-finished engineered wood flooring. Pre-finished is increasingly the finish of choice for solid wood floors. Site-finished (also called unfinished) accounts for about 25-percent of solid hardwoods today. Sanding Sanding is one of the greatest differences between engineered and solid wood flooring. Engineered wood can be sanded but only once or twice lightly, before the thin upper layer wears away. Solid wood can be sanded numerous times. Eventually, solid hardwood will become too thin after years of sanding, compromising its structural integrity. Installation Engineered wood is easier than solid hardwood as you have a greater range of installation methods, including stapling or nailing, fold-and-lock, or glue. Solid wood flooring is nailed or stapled down. It is never installed on a floating basis. Resale Value Because engineered wood floors are real wood, they can be advertised as such in real estate marketing materials, making them more attractive to buyers. As long as the floor is in good shape, it is on equal terms with engineered wood flooring in terms of resale value. Durability Engineered wood floors are durable, but not comparable to solid wood. Because the surface is thin, it can become chipped or de-laminated if stressed beyond normal conditions. Yet its ability to hold up to limited moisture helps bring up its durability rating. Well-maintained solid hardwood flooring will last for decades. Moisture is the enemy of this organic product. Wood floors do stand a chance of being salvaged after flooding, but they will never perfectly return to their former shape. Moisture Engineered wood is better than solid hardwood at dealing with moisture. Its plywood base is dimensionally stable, meaning that it warps and flexes less easily upon contact with moisture than solid wood. Fibers in plywood run in cross-wise layers, a far more stable structure than solid wood’s parallel fibers. Solid hardwood is never recommended for bathrooms, basements, or other areas where moisture is prevalent or even expected. Still, solid hardwood can resist some moisture. Site-finished wood flooring (as opposed to pre-finished), though, does have a sealed top layer that can shed some moisture. Hardness Hard hardwoods are the most durable, including many of the South American or Indonesian exotics, as well as birch, maple, and walnut. Soft hardwoods such as pine will not be found in engineered wood format. Solid hardwood encompasses a greater range of wood hardness than engineered wood. Hardness ranges from extremely soft and appropriate only for utility areas (such as Douglas Fir for workshops) to extremely tough hardwoods (for example, Brazilian Walnut). Installation Areas While it is best to avoid any kind of organic material in kitchens, engineered wood can can be made to work with proper precautions. Powder rooms are fine. Engineered wood can be installed below-grade with a proper subfloor and as long as the basement has absolutely no moisture problems. Solid wood works best in living areas, bedrooms, hallways, dining rooms. While it’s wise to avoid solid wood in kitchens, installation can be acceptable if waterproof mats are placed near sink and dishwasher. You should avoid installing solid wood flooring in bathrooms, though would be fine in a powder room. Never install solid wood floor below grade, in basements. Should You Buy It? Engineered wood is for those who want the look of wood but who have a practical bent. Engineered wood lets you install it in a few more rooms of the house than you can with solid wood. It will return value, but will not have the longevity that solid wood has. Solid hardwood is for purists who have long-time prospects in mind, yet do not mind installing different types of flooring in different parts of the house, according to need. Solid wood will return value many years down the road.